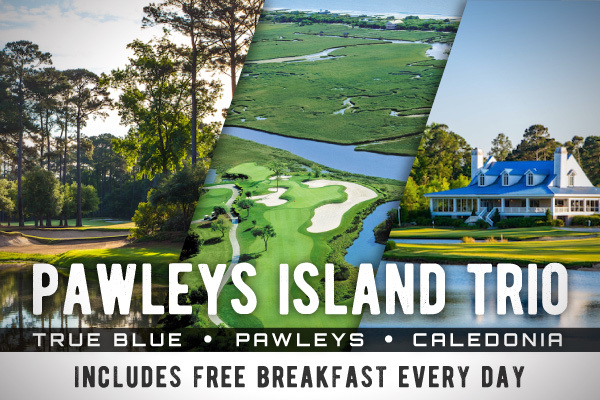 Pawleys Island Trio - Enjoy breakfast each morning, play 3 rounds of Golf at Caledonia, True Blue and Pawleys Plantation and enjoy a Dinner Buffet at Webster's Low Country Bar & Grill! DISCLAIMER: From rate is based on quad occupancy in a 2 Bedroom Suite/Villa at Pawley's Plantation. Advertised from rate based on best available rate for each season. Rates will vary based on stay dates and accommodations selected. Rates subject to change based on course availability. Coastal Dish Restaurant certificate is valid for 1 Prime Rib Dinner (Wednesday Nights). Gratuity not included. Offer subject to change without notice. Taxes & Fees Not Included.